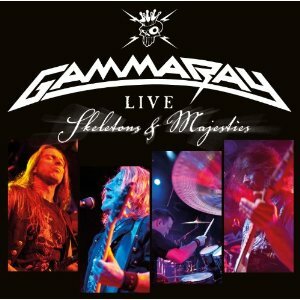 German metal legends Gamma Ray are releasing a new live album - "Skeletons & Majesties Live". The album was recorded at the band's show at the Z7 venue in Pratteln, Switzerland from April 29th, 2011. "Skeletons & Majesties Live" is being released on 2CD, Blu-ray and DVD. The DVD and Blu-ray feature additional bonus tracks, lots of behind the scenes bonus material, rare archive material and interviews with the band. The double CD includes a total of 18 songs (plus intro & interlude). The DVD and Blu-ray versions feature six additional bonus tracks with alternative versions of ‘The Spirit,’ ‘Wings Of Destiny,’ ‘Farewell,’ ‘Gamma Ray,’ ‘Time To Break Free’ and ‘Insurrection,’ all recorded at another show at the Zeche in Bochum, the day before the Pratteln show . In addition, the DVD and Blu-ray feature tons of behind the scenes bonus material, very rare archive material and interviews with the band. “Skeletons & Majesties Live” has a duration oftwo hours which makes it pretty good value straight away, and the setlist is a tour through the band’s history so far, including a mix of hits and classics as well as songs that don't get played so often. I'm guessing from the fact that the band sound to burst out in laughter at several points during the song that "A while in dreamland" is a song they don't play normally. It's a great album for Gamma Ray fans. Not only is the setlist a nice variation from the usual greatest hits setlist that typifies live albums, some of the songs are performed here acoustically so are given a very different sound. A great album and I look forward to seeing the band touring with Helloween early next year.